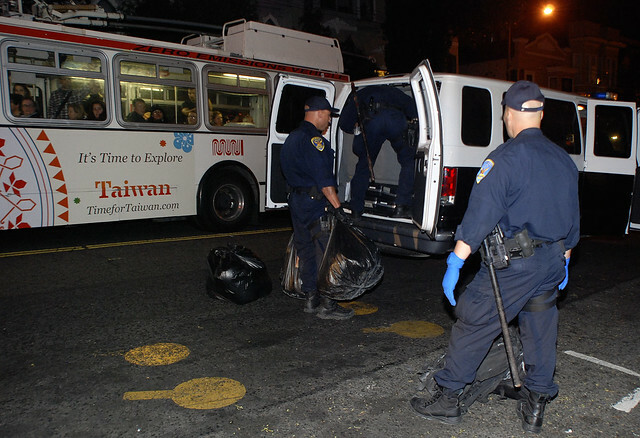 Approximately 20 people were arrested on Wednesday on suspicion of breaking into a vacant apartment structure in the 500 block of Castro Street, according to Officer Gordon Shyy of the SFPD. One protester was hospitalized after injuring her ankle while trying to leave the scene, according to Shyy. The protester will be brought to the county jail for booking after being released from the hospital, according to officers. The event was advertised online through various websites like Homes Not Jails of San Francisco, a homeless advocacy group. Protesters reportedly drilled holes into the building, which officers suspect were meant for securing signs and banners to the walls. Some of them broke the locks of the front and back doors of the property and also climbed up to the roof. Shyy said the suspects were wearing masks and hoodies and were carrying sleeping bags.